We the People… | Blah! 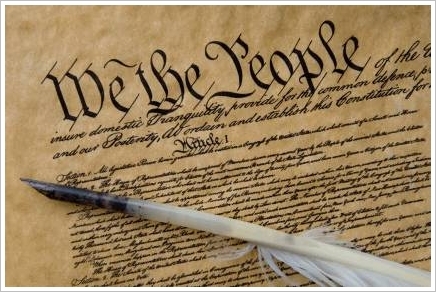 “We the People…” Is there a written phrase more recognizable, more iconic, than this? I was recently in DC for a symposium on Energy Security (which, incidentally, was very interesting; I may have to post some of the things I learned from that later). I’ve been to DC a few times over the last several years — working for a Department of Energy organization draws you to the capitol every once in a while. In previous visits, I’ve focused on the monuments, since I greatly admire some of the people to whom they are dedicated — Washington, Lincoln, and, especially, my boyhood hero, Jefferson. This time, however, I decided to check out some of the museums around the Mall. I’ve been there before, but there is so much to see. While I checked out the Air and Space Museum and the National Art Gallery, my primary goal was to visit the National Archives, home of the Declaration of Independence, the Constitution, and the Bill of Rights. The Rotunda where all three documents are on display wasn’t overly crowded, but still there was a little wait to get up close to each. Once I got my turn, I didn’t linger, as I knew what the documents say and it is easier to read them online. But, just being in the presence of such important history was both humbling and inspiring. Looking at the Declaration, you can barely pick out the signatures any more — even John Hancock’s signature is barely there. However, the phrase “We the People” which opens the Constitution is just so iconic, so powerful, it was what stuck with me, what really caught me. Is there any phrase in the English language that is so recognizable in its written form? So inspiring? So defining of an entire nation? Let me just say that it was truly remarkable to be in the presence of those documents and, in some sense, in the presence of those great men who drafted them.